Around 1900, the Amazon rubber boom changed the ways of the Boras forever. This period was disastrous for the Bora communities of the Putumayo as the Peruvian rubber corporations enslaved the Boras and forced them to harvest the latex from wild stands of rubber trees. Large numbers of Boras were wiped out during this period. Before the rubber boom, the Bora indigenous population was estimated as over 15,000 individuals. Some years later, following Peru's disastrous loss of the border war with Colombia in the 1930's and the ceding of territory north of the Putumayo, many Boras were evacuated to their present communities near Iquitos. By the 1940's the total population of Bora natives had dwindled to fewer than 450 people. If you would like to learn more about the sufferings of the Bora Indians during the rubber boom, read the book The Putumayo, The Devil's Paradise, written by an American adventurer W.E. Hardenburg in 1912. 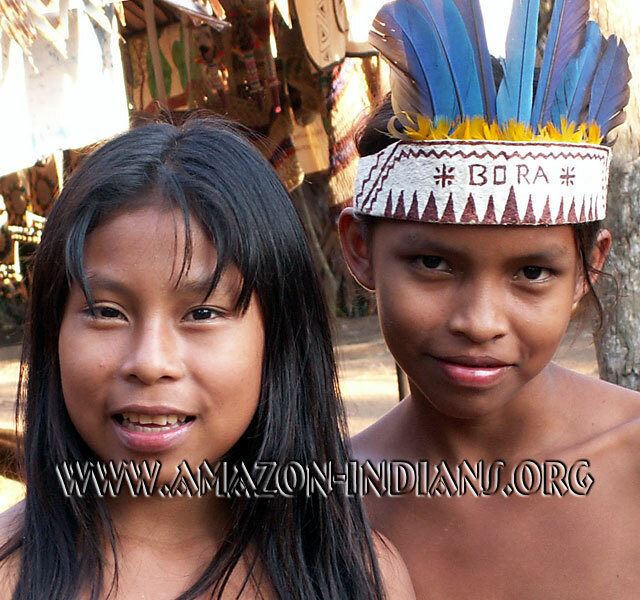 If you would like to meet the Boras or other indigenous Amazonians it is recommended that you do not use commercial tourist guides many of which are famous for exploiting Indigenous Amazonians. Instead, it is recommended that you deal directly with the Boras and have them work as your tourist guides. You can easily plan your journey in the Amazon on your own. You will need maps of the region, native language dictionaries, and various other materials that you are free to download in the Member's Area of Amazon-Indians.org. To become a member and get a password to the VIP area, you simply need to purchase one of the documentaries about native Amazonians.